2/5/2016Share this story on Facebook! Learn more about the Integrated Marketing Communications major at Ithaca College. From the magic of Disney to the intensity of the evening news, recent Ithaca College graduates are setting the precedent for the way brands use social media and digital marketing. 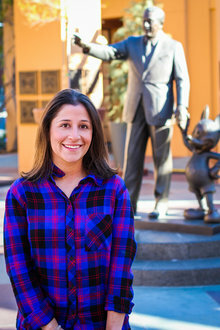 Danielle Giserman ’11 is a digital marketing manager at Walt Disney Studios where she oversees digital campaigns for movie releases. Most recently, she worked on the digital campaign for Disney's new animated film Zootopia. She has also been a part of the digital marketing team for movies such as Frozen, Cinderella, Maleficent, Jungle Book, and Inside Out. She said Inside Out—a Pixar movie that portrays a young girl’s emotions as five distinct characters—was one of the biggest campaigns she has worked on. For the campaign her team focused on the emotions and how one feels every day. They accomplished this by illustrating the emotions on all social platforms, using Facebook stickers, Bitmoji, Skype, and a Twitter handle called @headquarters where the emotions commented on real-world situations. They also worked with YouTube stars to discuss when they felt all five emotions from the film. Giserman, who majored in integrated marketing communications at Ithaca College, said every form of marketing has a social media component today, so she works closely with different teams throughout the company. Rob Flaherty ’13 is a deputy digital communications director for the Hillary Clinton campaign. He is in charge of a lot of rapid response communications, including writing and responding to tweets, making videos and producing copy for graphics. Flaherty said that he is mainly involved with the digital and social content that responds to the day-to-day argument of the campaign. This can range from responding when Clinton is attacked by other candidates, to helping to get their message out to online influencers. “Young people matter more than ever in this election, and getting young folks out to vote takes a lot of work from a lot of different people,” he said. Much of Flaherty’s job involves publicizing Clinton’s beliefs about the many issues affecting the United States today. He said he believes the Clinton Campaign is also fighting to resolve many of the issues young people care about, such as college affordability. Flaherty majored in politics and television-radio at Ithaca College. He also served as president of the Student Government Association, and he helped get approximately 150 students to the polls for Election Day through the IC Democrats. During his sophomore year at college, Flaherty worked on the campaign for Svante Myrick, who became the youngest person ever elected mayor in the City of Ithaca’s history. This experience gave Flaherty the opportunity to see first-hand that young people really can make a difference. He also interned with the Democratic National Committee, which helped him gain the connections and experience necessary to get his job working for Clinton’s campaign. “We’re introducing one of the best-known women in the world to America again, and I think it gives us this great chance to show off sides of her that no one really knows in creative ways,” he said. As a digital broadcast associate at CBS Evening News with Scott Pelley, Dylan Lyons ’14 is in charge of everything related to the show’s social media presence, including tweeting breaking news updates and live tweeting during the show. He gets an adrenaline rush, he said, from live tweeting the news, because breaking stories, such as the Boston Marathon bombing trial verdict, have a sense of urgency. One of the greatest challenges he said he faces in his role is learning how to generate interest for the content on social media while maintaining the high editorial standards of CBS News—rather than surrendering to “click-bait” style posts and content that isn't meaningful. “Our leaders understand the importance of having a strong digital presence, so I communicate with them on a daily basis to ensure we’re on the same page in terms of what we can do to push our content out online,” he said. That’s why, in addition to his main responsibilities, Lyons keeps up-to-date on social media trends. He even taught Scott Pelley how to use Periscope, Twitter’s live video app. Lyons majored in journalism at Ithaca College and said his classes provided him with a deeper understanding of the issues that plague the world and how they’re covered in the news. “As journalism continues its shift into the digital age, it is crucial for students to learn the skills to tell stories using cell phones and social media because that’s here a large portion of the audience lives,” he said. Lyons describes his future career goals as fluid because he is willing to try different things. But for now, he is satisfied with where he is. “I feel like what I’m doing is important,” he said. “I have the ability to craft how the news is distributed to an online audience and engage people in a way that’s very different from broadcast itself."